When it comes to generating sales for your hotel, direct bookings are often much more profitable and valuable in terms of returning customers than bookings made via Online Travel Agents (OTAs) such as Booking.com or Expedia. OTA commission rates seem to creep up each year, with some sites charging as much as 30 per cent in commission. One of the most effective, but criminally underutilised tools you can use to drive new customers to your website is social media. We often find that the clients we work with are overwhelmed by the prospect of digital marketing, unaware of its potential or unable to devote the amount of time needed to launching and maintaining effective marketing campaigns. To demonstrate just how powerful social media can be when used as a marketing tool for hotels, let’s take a look at Losehill House Hotel & Spa. Four years ago, this luxury hotel and spa located in the beautiful Derbyshire Peak District was not present on social media at all. They did have a website, but it was nowhere near the standard that guests could expect from such a high-end, reputable establishment. After creating a new website for the hotel, and giving them a presence on Twitter and Facebook, we managed to increase the revenue generated via their website by an incredible 823 per cent in just four years. Setting up social accounts and including a link to your website in your bio/about section is a first step, but this alone does not make up a social media strategy. Each hotel is different, and as such will need a unique approach to social media which not only reflects the hotel as a brand, but also achieves everything they want to in terms of sales and marketing. In the case of Losehill House, we focused our efforts on showing off the unique aspects of the hotel, spa and award winning restaurant, while trying to connect with customers looking to book imminently, and cultivating an audience of potential guests. You’re adding value to the guest experience, you are developing your brand voice and you are giving people another reason to visit your website. Getting the type of customer you are looking for to click on your content is not easy without being able to manage your different social platforms’ built-in advertising functions. Having a social advertising budget is highly advisable, but depending on the size of your hotel, this doesn’t need to be large at all. Providing you have accurate targeting parameters, it’s not difficult to make the most out of a modest budget. Facebook and Instagram in particular allow for highly tailored adverts, enabling you to reach users with the same demographics as your ideal guests. If, for example, you are a luxury hotel , you can target users that have expressed an interest in specific luxury brands and destination travel, narrowing by age, location and profession. This power to put your hotel right in front of the eyes of the exact people you are looking to connect with should not be underestimated. A strong social media presence allows you to build an audience, and keep them engaged with your brand. This has obvious benefits for new customers, but also helps you to develop a relationship with existing customers in order to capture repeat bookings. This is especially important for destination hotels or resorts, as guests are more likely to choose a hotel based on your brand, reputation, customer service and unique features. Different social channels allow you to work on all of these factors. Over the past five years we’ve discovered that in this industry a clearly defined social media strategy, when carried out consistently, pays real dividends. If you’re conspicuously absent from social platforms then it’s not too late to jump on the bandwagon, or if you are already on social then make sure you have confidence in your social media strategy and the resource to put (and keep) it in place – this way you’ll be on the path to freedom from unnecessary OTA commission and able to reap the benefits of an engaged social media audience. With so many interior design trends, it can be difficult to choose a style that fits a particular space best. While most of these trends intertwine, some are undoubtedly more popular than others. Since its launch in 2010, Instagram has become one the largest photo sharing social media networks. Along with Pinterest, this is where interior designers and architects tend to share colour schemes, ideas and projects. 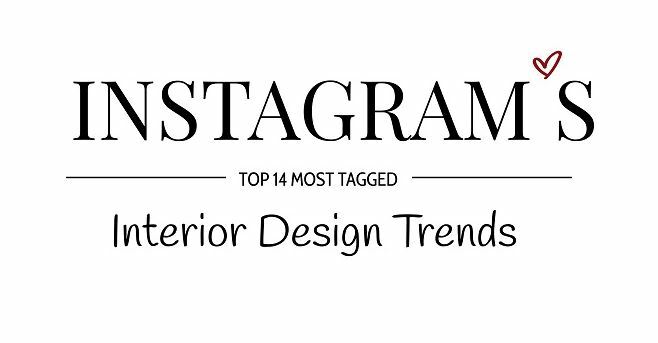 Following our exclusive series, Designing Instagrammable, here are the top interior design trends that are trending ‘The Gram’. 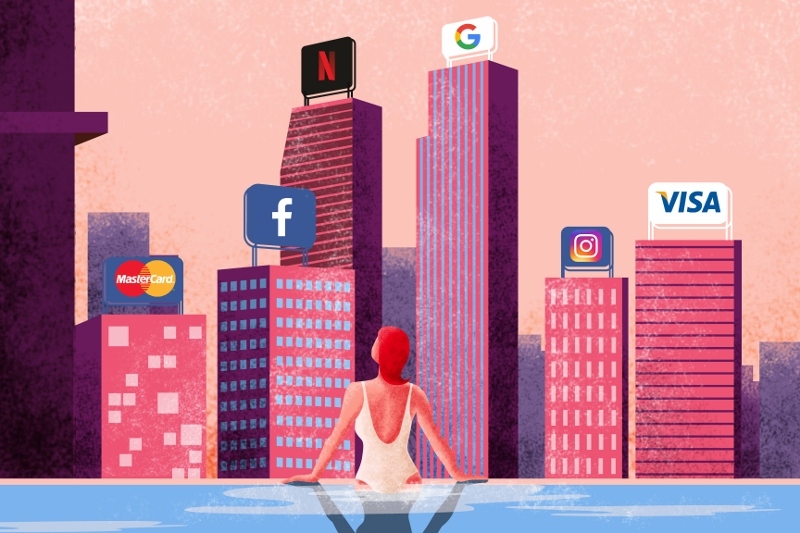 With the number of social media users worldwide in 2018 reaching a staggering 3.196 billion, up 13 per cent year-on-year according to Smart Insights, it was only a matter of time before hotels would launch schemes in order to help guests reconnect with the world around their screens. With the aim to take this initiative further, a hotel in Gothenburg, Sweden, has actually launched a hotel room where its rates will be determined by how much the guest spends on social media platforms. 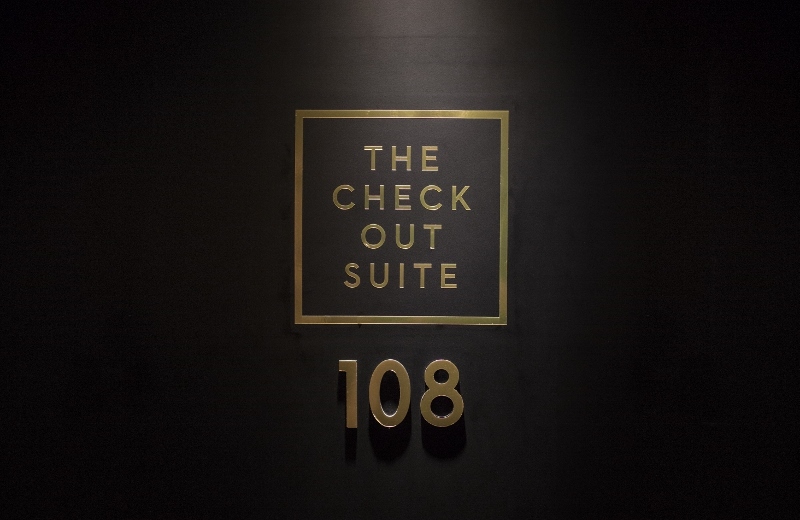 The Check Out Suite in Hotel Bellora is a unique hotel room that rewards visitors for staying away from their screens, allowing families to spend time with each other instead. The room is equipped with The Skärmfri™ (Screen-free) smart lamp, which calculates how much you pay for the room based on how much time you spend on social media. 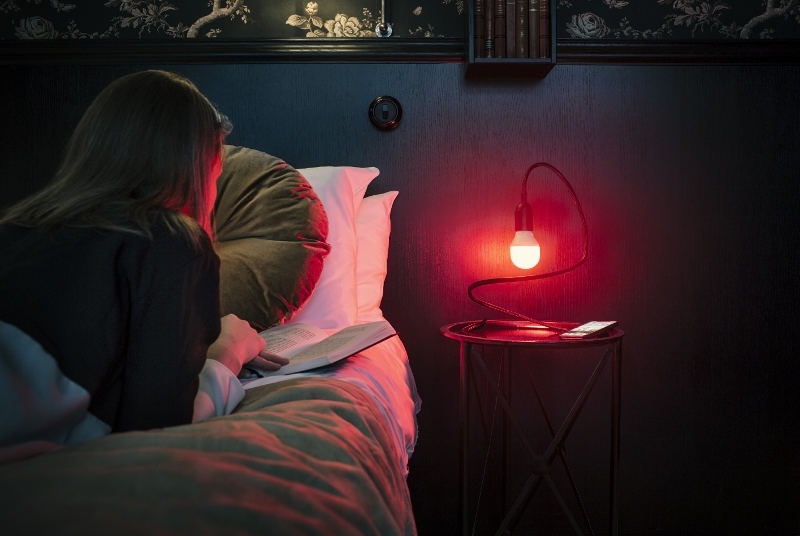 When guests connect their screen to the room’s WiFi, the lamp keeps track of how much time they spend on Facebook, Instagram, SnapChat, Twitter and YouTube. The light start glowing white and when the recommended time for recreational screen time of 30 minutes (according to studies) the lamp turns red. “We’re now taking our ‘Screen Help’ concept further in different ways. The Skärmfri™ lamp was one way to help, but now we have taken it even further and converted screen time into a currency that rewards a healthy digital life,” said Lisa Höglund, Head of Communications at Länsförsäkringar, a leading Swedish insurance company that works to improve digital health and social sustainability for individuals and families – in collaboration with Hotel Bellora. The price starts at 0:- (sek), so if guests don’t use your screens at all, their stay will be free of charge. When using the social platforms and the lamp starts switching from white to red, the price begins to increase. When guests have reached the maximum amount of recreational screentime, they will have reached the full price rate for the room. Pay-per-click advertising is something that just about every hotel has tried at some point, usually with underwhelming results. Typically, Google search ads gets the nod, with a carefully selected array of search terms (keywords) chosen, a daily budget set, and the campaign is set live. Whether this is set up by a marketing consultant, an agency, or even someone within the hotel itself, little regard is often given to ‘negative keywords’, if at all. These are the type of words and phrases that you don’t want to bid on, deeming them unsuitable or irrelevant to your product. Perhaps the most simplistic and obvious example being the omission of ‘cheap’ or ‘budget’ if you happen to be a luxury hotel bidding on a phrase-match or broad-match of the keyword ‘hotels in [your location]’. Put simply – your ad will appear when ‘hotels in [your location] is googled, but not when ‘cheap hotels in [your location]’ is googled. What you’re doing here is classing ‘cheap’ and ‘budget’ as negative keywords, in the hope that the users who click on your ads are (to a certain extent) pre-qualified, and hence, reducing the chance of wasted clicks and money. Fascinatingly, negative keywords are widely underused in hotel PPC (pay-per-click) campaigns, even if an external “expert” has set up the campaign and is managing it. All too often, my team and I will research which companies are advertising on certain keywords and find that the ad for a hotel in Devon has appeared for the keyword ‘wedding venues Lancashire’. Whilst the more observant of browsers might spot this and choose not to click, the majority of Googlers are trigger-happy and care-free with their clicks, serving to burn through the hotel’s (often modest) budget in a wasteful fashion. Whilst this location-based ad is an example of an incorrect campaign setup, sometimes the words and phrases you might wish to omit as negative keywords are less obvious. For instance, a spa hotel may bid on a broad-match of the keyword ‘spa hotels near Bristol’ and ensure that price-led words (cheap, budget, etc) and incorrect locations are saved as negative keywords during the setup but find that further words and phrases need to be omitted weeks after the campaign launches. 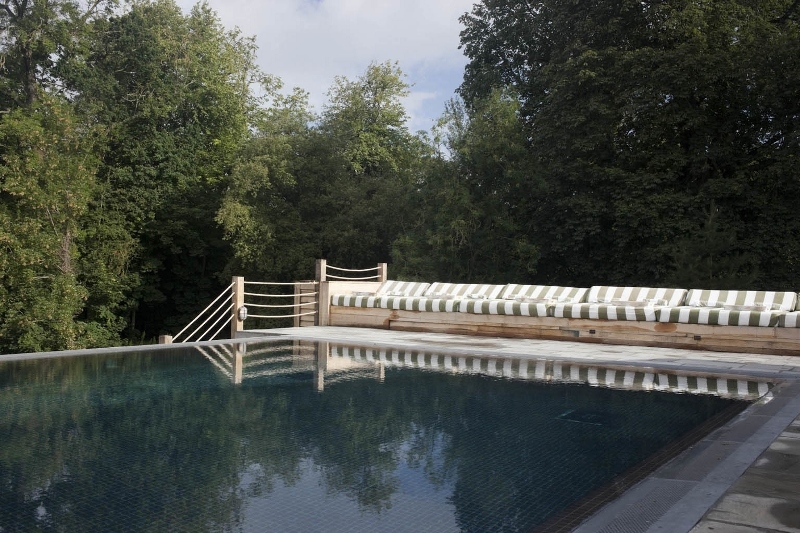 ‘Spa hotels near Bristol with an outdoor pool’, for example could have been the actual search term typed into Google that achieved a click but omitting ‘outdoor pool’ wouldn’t necessarily be an immediately obvious choice as a negative keyword if the hotel in question doesn’t have this facility. This is where continuous management of your negative keywords is essential to keep wastage at a minimum. To do this, it’s a simple case of regularly (we recommend weekly) reviewing the actual phrases that people Googled before clicking on your ad, which you can access easily – this is referred to as your ‘search terms report’. Reading through this list, you’ll be able to see the weird and wonderful list of things people Googled that were deemed a broad-match or phrase-match to your selected keyword. So when you thought you were innocently targeting people searching for ‘hotels in Manchester’ you might find that you paid £2.47 for a single click when someone searched for ‘why are hotels in Manchester so expensive?’ or ‘what are the best hotels in Manchester to photograph.’ Clearly the intent to book in these two examples is somewhere between low and non-existent. Worse still, it is not uncommon to find a poorly managed campaign regularly spending 60-80 per cent of the budget on clicks where the Googled terms are similar to the above examples, serving to burn through the budget with an enormous amount of wastage and few (if any) conversions. The solution however is simple, if time-consuming at first. A weekly review of the search term report will show you where your budget is being spent and what you will to need omit thereafter. In this example, ‘photo’ or ‘photograph’ is unlikely to crop up regularly but worth adding to the negative keyword list. ‘Expensive’ featuring in the browser’s search might suggest a low-price requirement and should be added if the hotel in question is at the higher end of the market, and similarly a search term that features ‘why’ is likely to come from a browser with little or no intent to book and would also be a good term to add to the negative keyword list. If a PPC campaign is well-managed, the list of negative keywords should continue to grow, serving to refine the clicks to only the most suitable, high-intent browsers. Hotels can be forgiven for not having the time or knowledge to implement this continuously and effectively, but marketing professionals cannot. If in doubt about the effectiveness of your PPC campaign, it’s advisable to ask the person or agency managing it for the list of negative keywords associated to the campaign. Based on the high volume of poorly managed campaigns we see regularly from hotels, there’s a good chance that list won’t be long. The first article in this series by Hamadache explored why hotels should be ‘remarketing’ themselves. The second article in this series by Hamadache explored why hotels should learn all about the new SEO. For those of us that are not technically-minded (or gifted, for that matter), an ‘algorithm change’ by one of the big tech companies offers little in the way of stimulation. Not least because there seems to be a new one every month, with each new update promising to ‘change the internet as we know it’ or so the scaremongers would have us believe. So when Facebook were making a ‘big announcement’ earlier this year, understandably, few paid a great deal of notice across the hotel industry. And yet, it’s probably been the biggest digital shift since those online travel agents turned up 10+ years ago. Remarkably though, nearly 12 months have gone by and it’s still relatively unnoticed by many. The logical question therefore being: if it’s gone unnoticed by so many, was it really all that important? Most hotels, especially those at the higher end of the luxury spectrum, spend time, money and effort on keeping their Facebook pages up to date, but without a basic grasp of the Facebook algorithm change that came into effect in January 2018, a hefty chunk of that investment is being completely wasted. At the start of 2018, Mark Zuckerberg, the co-founder and CEO of Facebook, announced that the social media platform would be prioritising ‘meaningful interactions’, meaning that as a user, you will be served posts that it believes you are most likely to engage with by way of a like, comment or share. Furthermore, ‘friends’ would get a higher prioritisation than ‘pages’ (businesses) in your newsfeed. It went further to explain that content from within ‘groups’ would also be given a higher level of prioritisation. All very logical. To put it another way, if someone liked your page two years ago and hasn’t liked, commented or shared any of your posts in that time, the chances of them continuing to see your Facebook posts is close to zero. So if you happen to have 10,000 Facebook likes on your hotel’s page, but 9,500 haven’t really engaged with your content for a long time, your audience is not 10,000, it’s much closer to 500. This all makes commercial sense – for years Facebook gave us all a very loud megaphone for free. We could boom our messages to a captive audience, chat with them and even sell our products and services to them. Now they’ve effectively turned down our metaphorical megaphones to a volume slightly louder than a whisper, and conveniently given us access to the volume button, but only if we’re prepared to pay for it via boosted posts and the like. The most notable thing however is that video posting doesn’t seem to have been subject to the same limitations in reach. Where an image or text post might reach 300 people, the same content in video would likely reach closer to 1,000, all things being equal. That’s significant for hotels, especially at the higher end of the market, who’s products lend themselves well to this medium. Beautiful room pans and aerobatic drone shots that bring the product to life, sell a hotel far better than a cluster of images. And yet, fewer than two per cent of hotels are utilising this channel to its full potential, continuing to naively post text and images to an audience that hasn’t necessarily lost interest, they just can’t hear you through the noise. ‘Groups’ on Facebook are also a fantastic way to quieten the pages and friends competing for your customer’s attention. Facebook deems a group slightly higher ranked than a standard business page, so encouraging your followers to join a ‘VIP’ or ‘special offers’ club has proven a useful means to continue the conversation and engagement. There of course remains the question as to whether Facebook has had its day, and whether other social channels will take the mantel of the biggest social media platform. A valid discussion point, but as of September 2018, Facebook still had 2.27 billion active users use its site, compared to Instagram’s one billion. The world of social media will inevitably change over time, but for now, Facebook is still top dog, and hotels who invest in content for the site, must adopt a video-centric approach, or risk having their messages drowned out by the noise. The second article in this serires by Hamadache explored why hotels should learn all about the new SEO. We’ve all seen those ads that seemingly ‘follow’ us around the internet. One second, you’re browsing for a new pair of shoes, five minutes later you’re being unwittingly followed by that very pair of shoes on a website completely unrelated. If it’s not happened to you yet with footwear, it’s almost certainly occurred on your web browser as a result of searching hotels on Expedia or Booking. Minutes, hours or even days later, that hotel you liked the look of in the Cotswolds for the weekend break you’re planning is displayed in front of you again, complete with price, image and a ‘book now’ button. 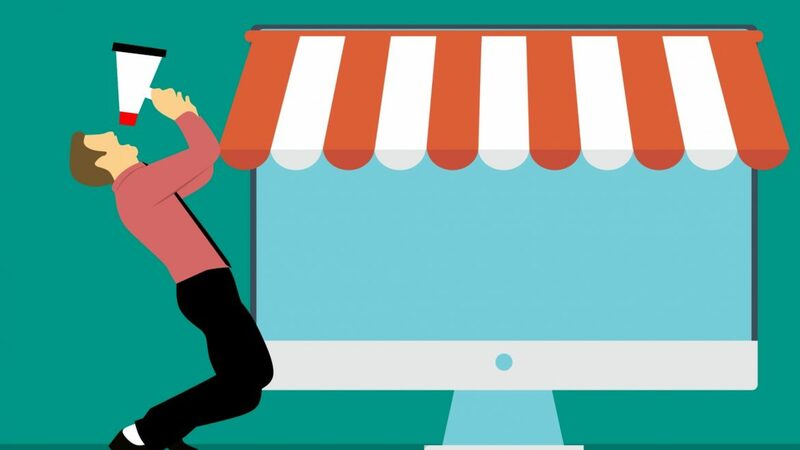 Google refers to this form of advertising as remarketing – so named as they are ads fed to you only once you’ve visited a particular website or webpage, and literally re-marketed back at you, in a bid to encourage you to return and complete your purchase. Facebook also runs something similar across its network of both Facebook and Instagram. 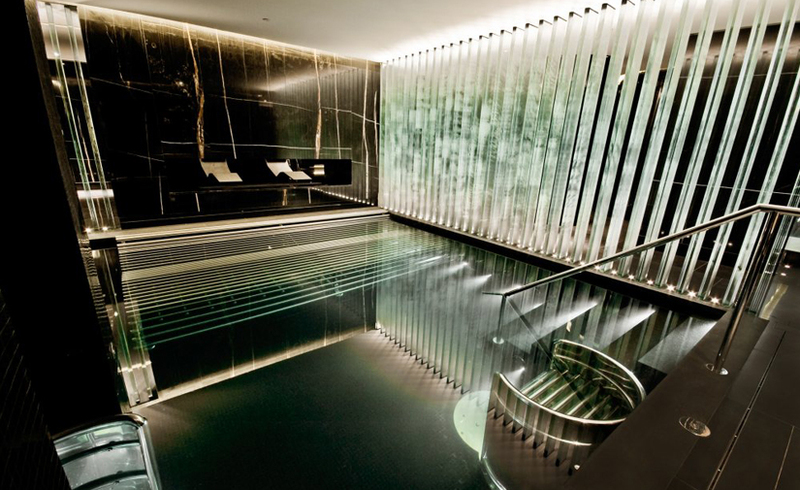 Needless to say, it’s an incredibly effective way of reminding hotel bookers to return and complete their booking – especially leisure bookers who are looking for that special-occasion stay and perhaps wanting to spend a little more than usual. Consumers have more choice than ever before, which has inevitably meant the time taken to successfully choose and book a hotel has become longer in recent years. In some cases, leisure bookers are taking weeks to choose the right hotel, on the right platform that represents the highest value based on their own individual booking criteria. This is why remarketing is so effective – you only need to have a potential booker visit your website once, and Google will allow you to follow that customer for as long as 18 months – for free! Seems too good to be true, but here’s how it works: a simple piece of coding is placed on your website, dropping a cookie on the user’s web browser. That cookie then triggers your hotel’s ads on a pay-per-click (PPC) basis on websites across the internet. Impressions (views) of these ads cost you (the advertiser) absolutely nothing. Let’s put this in more pragmatic terms: using this form of advertising, you’ll be able to advertise back to anyone that has previously visited your website in excess of 40,000 times, for about the cost of £40 per month. That would be the equivalent of running advertising all the way around Chelsea Football Club’s stadium, full of potential customers that have shown some interest in your hotel in the last month, and paying just £40 for the privilege. The reason it’s so inexpensive is primarily due to the click-through-rate (CTR) being extremely low. These ads will appear in the background, gently reminding your potential customers about your hotel but few will click (and you only pay when someone clicks). Rather, they’ll probably need to see your ad 30, 40, 50 times before any action is taken. Despite the cost being so low, and the targeting being so high, the real magic of this form of advertising, arguably is that so few hotels take advantage of this clever platform. It’s rare to see an individual or an independent hotel advertising in this way. 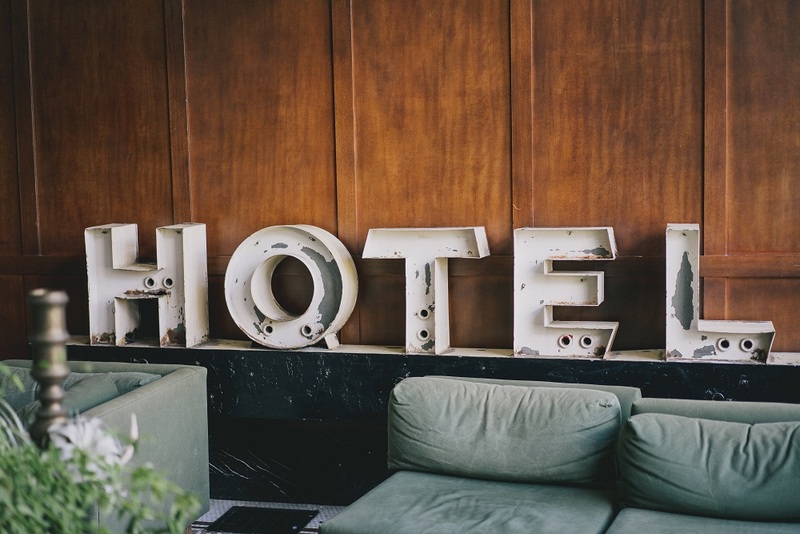 This ultimately means that implementing this form of advertising can give your hotel a distinct advantage over your competition, not to mention the online travel agents! In terms of the design of these ads; simple is best. An eye-catching image, your hotel’s logo, a ‘book now’ button, and on some of the larger-sized ads, a ‘book-direct’ message is advisable. These ads shouldn’t be a platform to sell all the benefits of the hotel, rather an opportunity to remind the potential customer of your business and hope they return to complete their booking. At present, Google allow you to run these ads for a maximum cookie duration of 540 days. This means that your ads can be shown to each individual web-browser for up to 18 months, or until they decide to clear their cookies. Given the low cost of this advertising, it’s advisable to utilise this maximum length, as it can never hurt to gently stay in touch, reminding the web-browser that you exist and are open for business. Typically, best-practice dictates that the style and design of these ads changes every few months, and these ads can even be animated to really catch the eye of your next hotel guest. As weeks go, this one has been rather sensational, unforgettable in fact. Following an insightful Independent Hotel Show, I have spent the majority of the last seven days checked in to one of Zimbabwe’s finest hotels, Matetsi Victoria Falls (review on Hotel Designs coming soon), to really understand the design journey – from the birth of a concept to completion – of creating a luxury hotel. While being ‘in the bush’ – and understanding the challenges faced when creating luxury in 132,000 acres of safari reserve – I have been corresponding back home with the editorial team in order to report on this week’s top headlines. At the top of the news chain is unsurprisingly Hilton Hotels, as this week it unveiled a new ‘affordable lifestyle’ brand to the world. Meanwhile WATG, of whom its UK Managing Director, Martin Peace, is shortlisted for The Brit List 2018, announced its completion on yet another five-start hotel in Asia. Hotel Designs passed the four-weeks-to-go mark before the highly anticipated Brit List 2018 by announced yet another sponsor. And laying down some serious style, Recommended Supplier Kobe had a message to deliver to the industry: “Go bold or go home.” Here is our top five stories of the week. 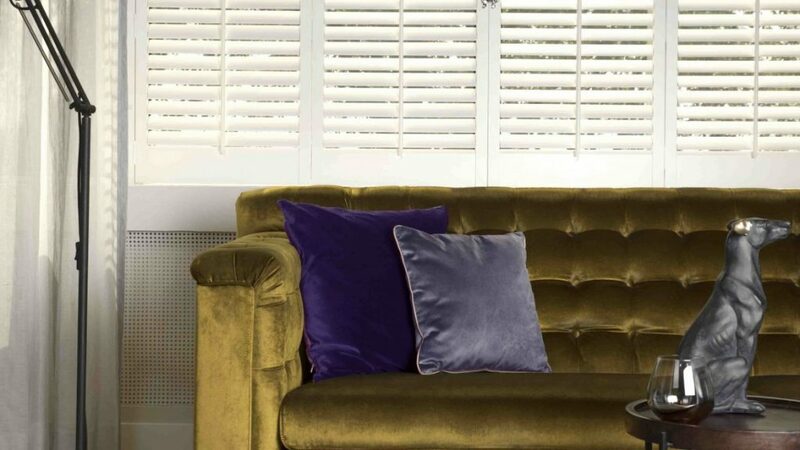 As the industry prepares to celebrate the leading British influencers in hotels, interior design and architecture, Hotel Designs is proud to welcome the flooring experts Tarkett, which will sponsor the Inspiration in Design – Interior Designer of the Year award. 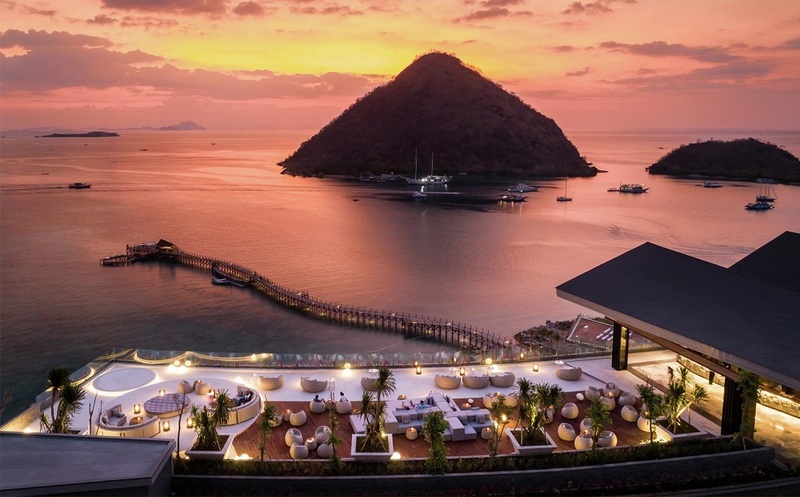 Design firm WATG has opened the doors to its brand-new contemporary hotel in Indonesia, The Ayana Komodo Resort, Waecicu Beach, marking the third Ayana property across Asia. The world of social media is constantly evolving, making it crutial for hotels to stay ahead in the market. Serena Dorf, a content writer from Los Angeles, shares her top tops to help hotels remain competitive in the digital sphere. 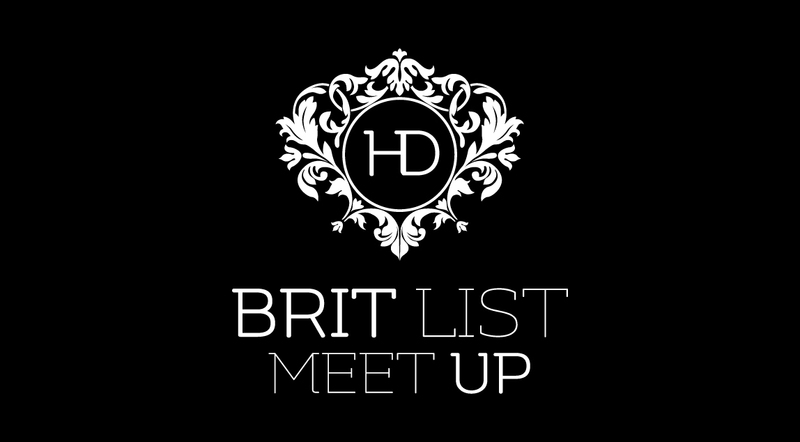 If you are interested in attending this year’s Brit List, there are still limited tickets available. Click here to secure your place. In today’s digital era, every business is forced to survive and adapt to the ever-changing marketplace shifts. If ten years ago traditional marketing was king, nowadays, the digital marketing medium seems to be the most pronounced. As a hotel owner, you’ll have to adapt to the current effective marketing practices that can bring you exposure and eventually more bookings. Social media networks are currently the trendiest way to promote a business online, mostly because it allows brands and customers to communicate directly and to build purposeful relationships that’ll serve both parties for an undefined period of time. It’s the 21st century – most people regularly use a phone with internet on it and with at least one social media network installed. Some phones even have social networks installed by default, so it’s quite probable that your target audience is present on at least one big social media network. Doing the simple math, we come to realise that social networks are the best platforms that can be used for hotel promotion. For that reason, we’ll discuss seven simple tips and guidelines that’ll help you effectively promote your hotel on social media. Every brand needs to differentiate itself from the rest in one way or another, in fact, that’s what branding means. By developing social media profiles and sharing consistent quality content, you’ll begin shaping your brand’s voice. For example, Nike is using a motivational voice to inspire athletes, while Dove uses an inspirational approach to help women improve self-esteem. They use social networks to implement this strategy, and they reap amazing benefits in terms of engagement and customers’ loyalty. As a hotel, you can develop a brand voice (cozy, luxury, affordable, etc) and keep it consistent throughout time. When you share new updates, make sure your visual content and the description of the post are consistent with your hotel’s culture. You can gain a lot of new customers by encouraging them to enrol in different contests. You can start a user-generated campaign and offer prizes to the most creative submissions. For example, as a hotel, you can encourage all your hosts to take pictures and list the three biggest benefits of staying at your hotel. The best three reviews can win a free week during the holiday season. Share this contest on your social channels and track your engagement. Learn from the results and replicate the process once you find it suited. When brands go viral, their entire fate changes overnight. Hundreds of thousands if not millions of people will become aware of their existence, so they’ll be reaping traffic benefits for a long time. Becoming viral is an art. You need to get into the mind of your audience, dig deep and seek their inner desires, and test different approaches until the results are satisfying. When people share a social media post, they do it because they found it remarkable (worth-of-remark/share). Hotels can emphasise visual components (beautiful surroundings), their food specialties (a video of a super delicious dish, served professionally at your hotel), or perhaps something else, something original that is worth sharing. The biggest social media networks (and the ones that encourage virality the most) are Facebook and Twitter. Therefore, if you ever were to use paid advertising to increase your odds of getting viral, these should be your first two choices. If your social media followers engage with your page or subscribe to your email list, you can offer exclusive content and discounts to reward the loyalty. By taking this approach, your prospects will be eager to choose your hotel instead of the competitors’ because they’re reaping additional benefits besides the normal booking option. “Social media marketing isn’t a quick result that must be achieved. In fact, it is a journey that keeps going until social networks stop being used (never) or until you have so many bookings that you absolutely need to close your social pages (never). Therefore, your social image remains a constant responsibility,” said the marketing manager at EssayOnTime. You’ll need to share new updates, answer prospects’ inquiries, respond to positive/negative reviews, and so on. All in all, you’ll need to give the impression that your hotel is active, committed and easily reachable. Hotel marketing is always better if visual content is present. Before a person books, he or she will want to ‘get a feel’ of the place. The best way to help your potential client choose you instead of your competitors is to offer high-quality visual content. Pinterest and Instagram are two of the biggest ‘visual’ social networks; places that people use mostly for their visual benefits. Great pictures, funny gifs, and short videos are some of the most popular formats that hotels frequently use to improve their reach and followers’ base. Social media influencers are not TV stars; they’re not famous celebrities that offer incredibly pricey advertising options. In fact, an 18-year-old teenager with 10.000 engaged fans on Instagram, Twitter, Facebook, or any other social network becomes a micro-influencer that can potentially boost your hotel’s bookings. Reach the people that have a target audience that is very close to yours – establish your standards (big influencers obviously cost more) and start negotiating a price for their promotion services. Promoting your hotel on social media is not rocket science. By using our insightful guidelines, you can tap into the power of social media networks, the same power that’s leveraged by the biggest hotels in the world. Some of them reached the peak by mastering the art of social media marketing, while others have enhanced their reputation and brand image over time. 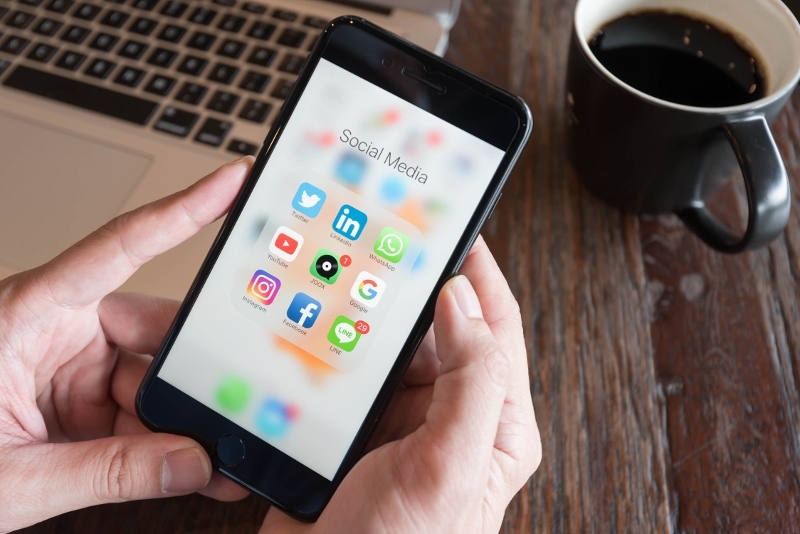 Regardless of your purposes, social media networks are the most suited tools for every hotel owner who doesn’t simply expect clients to randomly drop off at their door. Take our tips into consideration and start promoting your hotel the right way. Lights, camera and action. That’s right, here at Hotel Designs we are counting down the days before the curtain rises on yet another full and fabulous London Design Week. 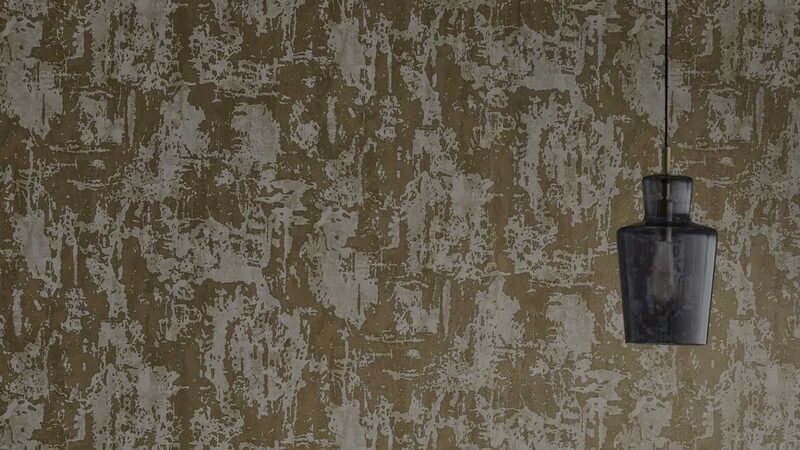 As the drumroll roars ahead of designjunction, Decorex and 100% Design, here are the top five stories of the week. It’s a busy time in the Hotel Designs HQ – when is it not? With less than a month for designers, architects, hoteliers and suppliers to get their free entries in, we have announced this year’s esteemed judging panel. Blue is in this season, according the Decorex. 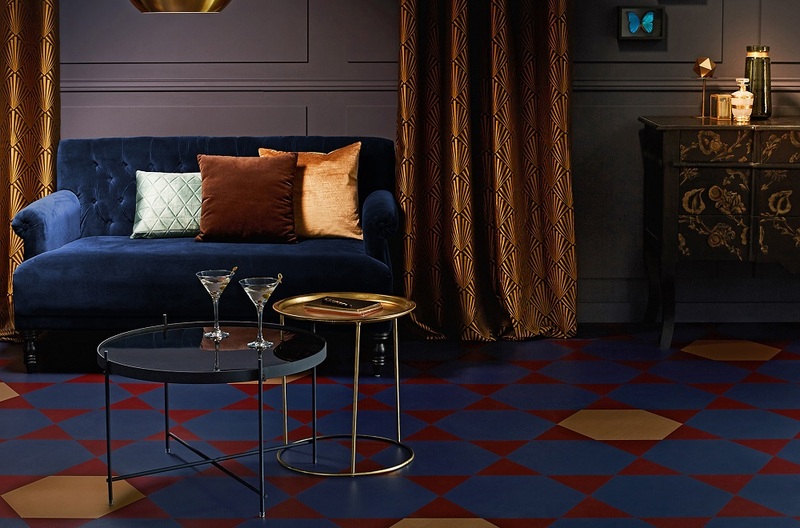 In addition to the bold statement that blue will be bold during this year’s London Design Festival, the BIID has also announced its plans around all three of the major shows, of which Hotel Designs is a media partner for all…. INSIGHT: How is the hotel market performing online? The Hotel Sector Report, produced by digital marketing specialists Inside Online, ranks 46 of the leading websites within this competitive market according to their online performance. The annual study reveals the successes and shortcomings of each website, highlighting where there is room for improvement. “It’s been a fantastic year for the hotel sector with nine of the top ten seeing improvements in their visibility,” commented Gemma Curtis, Inbound Content Marketer, at Inside Online. “It looks like paid media is the way forward when it comes to getting your Hotel site to the top of the SERPs. “Overall, there is a big difference between the number of the brand searches and owned social score across the board. Content was on-brand, frequently posted and mostly varied but we weren’t wowed by any hotel company in particular. Following Hotel Designs’ recent focus on social media, it seems as if UK company Premier Inn leads the overall social charts, coming in first place for brand searches per month but outside of the top five for owned social scores, led by Marriott. The social score considers followers and engaged conversations on all major social platforms. Similarly, however, Hotel Duvin [40,500] had a high brand search but recorded an owned score of 86, while Britannia Hotels scored 27,100 against 13. Easy Hotels has a brand search score of 22,200 but owned social of 26 while Corinthia and Warner Leisure both score 12,100 for brand search against owned scores of 73 and 61. Conversely, Marriott leads the owned search scores with 5,214 but only recorded a brand search score of 60,500. Links have always been an important ranking factor and can make all the difference to how far up a brand appears on Google. Consistently gaining new high-quality links can be great for business; however, high-link volumes without the quality could spell trouble ahead. Hilton has the highest average number of links per month of high quality, which is likely because they are an international brand with many different subdomains and franchises. Most of their links are going to the various hotel sites, and they don’t appear to have any creative content outlet. IHG, on the other hand, has a blog gaining many links, covering topics such as the best places to shop, eat, stay or things to do in various cities – which puts them in second place. 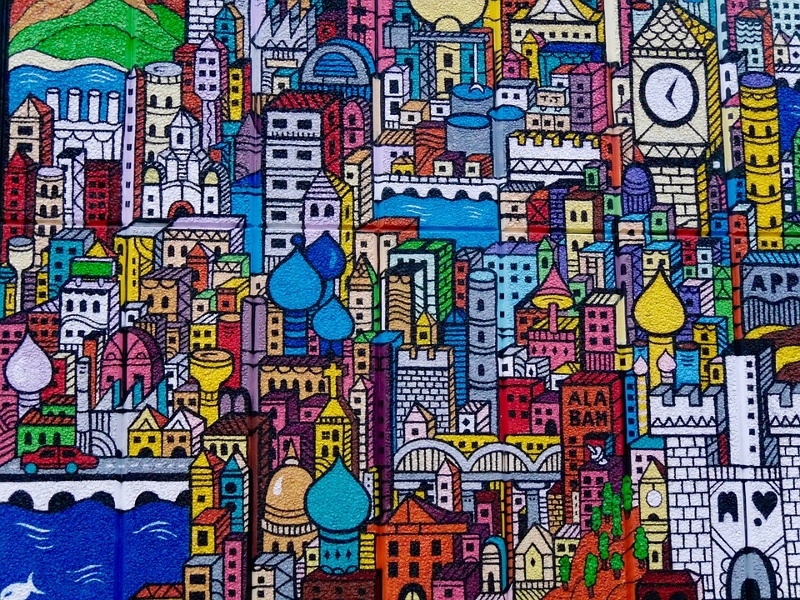 There are several sites with ‘high-quality, low-volume’ links; these include Radisson Collection, Star Hotel Collezione, Apex Hotels, CP London City and Point-A Hotels. Conversely, there are also sites with ‘low-quality, high-volume’ links, such as Corinthia, Best Western, Q Hotels, Campanile and W London. Consistently gaining a high quantity of low-authority links highlights an urgent need to address your off-site reputation. There’s a funny internet meme doing the rounds of a little boy asking Mark Zuckerberg if it’s true what his dad says that Facebook is spying on people, to which Zuckerberg simply responds ‘he’s not your dad’. But while the Cambridge Analytica saga may have done some serious PR damage in the short term, big data’s here to stay. Not in the least because it’s quite literally unstoppable. Advertising companies, insurers and supermarkets have been using big data for quite some time now because it allows them to better tailor their products to their users. In design, however, it’s still very much in its infancy. At Valé, we predict a huge shift over the next ten years in hospitality design. It’s a shift where predictive behavioural analysis will gradually replace the industry’s traditional reliance on intuition and guesswork – hopefully putting an end to wasteful design once and for all. Big data involves extremely large data sets which can be analysed by computers to reveal patterns and trends about how we behave and interact with each other. It’s closely linked with Artificial Intelligence (AI) which allows machines to evolve and improve their own learning by consistently updating their data sets. It’s a pretty common misconception among designers that big data bears no real relevance to hospitality design. We disagree. At Valé we see huge potential in big data helping us to further personalise guest experiences in the hotels, restaurants and bars we design. The shocking misuse of personal data by companies such as Cambridge Analytica and indeed Facebook itself has given big data a bad rep. Unfortunate as it is, this isn’t likely to be more than a temporary blip while society tries to wrap its head around some of the ethical boundaries. From a design perspective, we can’t foresee many ethical issues. After all, we’re not seeking to influence a guest’s thinking or political views. We’re only seeking to understand their needs better so we can predict their behaviour and movement on site, which will then allow us to design our building around that. Personalising guest experiences has probably been one of the biggest trends in hospitality over the past ten years. It’s a scary concept for many business owners and operators. After all, how do you personalise your services without losing your economies of scale? But it’s a big issue for us as designers too, because how do you design a building that caters to so many different people’s unique taste and needs? Luckily, and no matter how wonderfully weird and unpredictable we like to think of ourselves, we’re also creatures of habit. Whether we like it or not, our behaviour follows patterns. Big data allows us to uncover those patterns. With the right information and of course the right tools to interpret it, you can predict most types of behaviour ranging from a person’s spending habits and their family set up, to their living situation back home and how influential they are on social media. As designers this then allows us to predict how a particular type of guest is likely to make use of a building, for example where they’ll prefer to sit, how much they’ll spend and the kind of pictures they’re likely to post on Instagram. From a business owner’s perspective, it allows you to increase your bottom line by allocating your design budget and resources in those areas of your building where you’re future guests are likely to spend most of their time and money. Speaking of personalisation, many operators and designers rarely get any further than the generational ‘millennial’ tag when it comes to identifying their target customers. But those elusive millennials love everything from a cheap bamboo beach shack in Bali to the Hemingway Bar in the Paris Ritz. It simply doesn’t make any business sense to cater for such a big niche. And as the quote goes, ‘if you try and be everything to everyone, you’ll end being nothing to no-one.’ You really need to understand the world of the customers and guests who are likely to be coming through your doors. We’ve previously written about the design approach which brings together User Centric Design (UCD) and guest profiling. 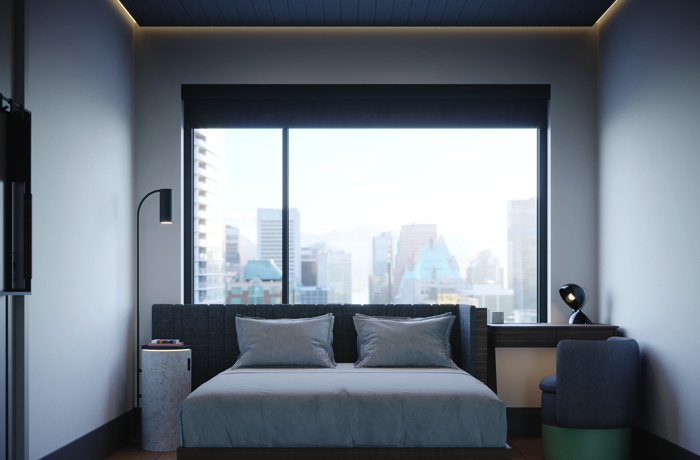 As we continue to fine tune our own guest profiling for the hospitality industry, we’re particularly excited about the work that’s also being done elsewhere by a number of startups and others. They provide the backbone data for the type of behavioural analysis that makes it possible to more or less accurately predict how your building is likely to be used. Companies such as Helix Personas, Defin’d, Experian and Ipsos make use of data sets built through either tracking apps, websites, surveys, local statistics providers, or a combination of those. They build very specific user profiles and behaviours by merging their own data with additional datasets such as hotel bookings, surveys and tracking apps. Other startups such as Neighbourlytics and Picodash go even further by pairing their data with information that’s public on social media accounts, or with certain government data sets which give them a better understanding of public behaviour in a particular local economy. With the growth of consumer networks like fitness tracking, food delivery apps, shopping services and social media, the volume of consumer data is growing at an extremely rapid rate. These datasets provide massive opportunities for us as designers to better understand the behaviour of our future guests and to put an end to wasteful design. Big data is already big business for most banks, insurance companies and advertisers. Very slowly we’re starting to see a shift in attitude closer to home, with a number of large-scale developers dipping their toes in the water. Some are already in the early stages of user profiling as a way to help them build homes that are better suited to their target buyers. At Valé, it’s our core mission to be at the forefront of innovation when it comes to guiding our design process. We’ve no doubt that big data analytics and behavioural analysis will be the bread and butter for hospitality design in the next ten years. Trust us, you won’t want to be left behind on this one. Designing Instagrammable: Does my art look big on this? Pablo Picasso once said that art’s purpose is to wash daily life’s dust off our souls. If that’s true, then we owe a great debt to the many public and street artists for keeping our spirits clean and the art authentic. Public art has been around since we were still hanging out in caves painting mammoths. When done well it can make us think, act and feel in ways we didn’t do before. Done badly and it’ll be laughed at or worse – ignored entirely. As designers we’re usually more than happy to be called artists. Yet, many artists would shudder at the idea of being called designers. So what’s the deal here? Artists and designers both create visual compositions, but their motives are different. The artist wants to create an emotional bond with their audience, while the designer wants to motivate that audience towards taking a particular action – like buying a product. Looking at it differently, artists are often the experimenters, while designers are the implementers whose role it is to merge creativity with wider commercial goals. But more interesting than the definition of art is the general public’s response to it. 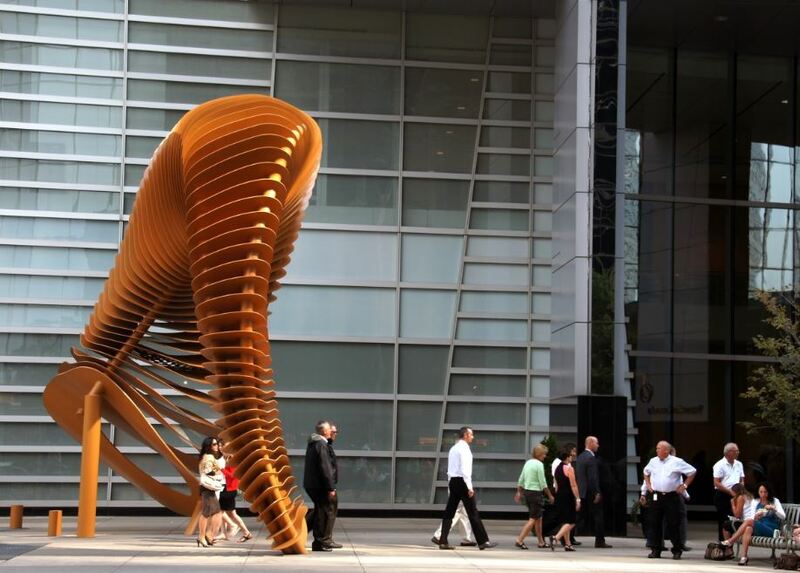 Public art always intends to connect with a far larger audience than fine art. Historically that audience was mostly limited to locals and visitors, along with perhaps a small circle of unfortunate souls back home sitting through the holiday snaps. 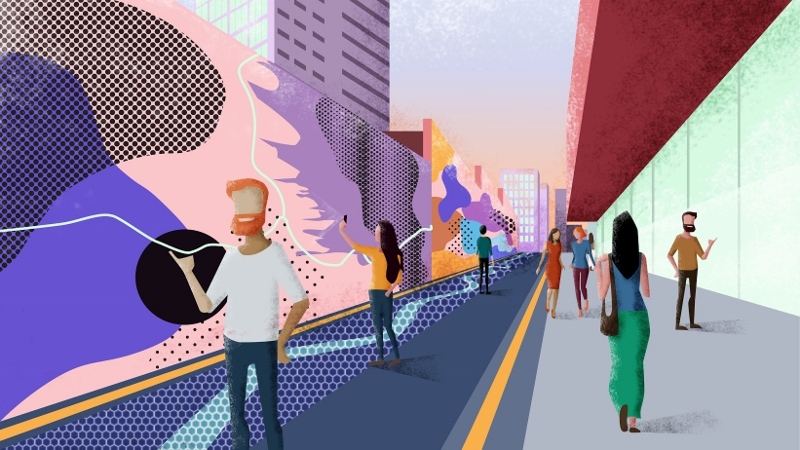 But with a high-quality camera in everybody’s pocket, 2.2bn active Facebook users and more than 1 billion active Instagrammers each month, the potential audience for a public art or design piece is now limitless. Over the past ten years, literally everybody has become a photographer, art critic and influencer all at once. They’ll share what they feel is remarkable with their tribe, regardless of whether it constitutes art or not. A great example of how public art and social media go hand in hand can be found in the small outback town of Coonaplyn in South Australia. Once a bustling rural town, Coonaplyn had been down the dumps following the centralisation of its local businesses to other nearby towns. The local Coorong District Council felt something big needed to happen to put the town back on the map. It commissioned Brisbane based artist Guido Van Helten to turn five large grain silos in the centre of town into one large piece of public art. Famous for his large-scale portraits, Van Helten created a series of murals each immortalising a particular local resident. The response from the town was overwhelmingly positive. As local business owner Debbie Thompson put it: “you can’t make people stop, but you can create a reason for them to stop”. Coorong District Council’s bet paid off because the art led to a significant increase in the number of cars stopping on their way through town. Local officials estimated that the stopping rate went up by around 40 cars per hour, which eventually led to the opening of a new cafe and grocery store. That may not sound like a lot, but in a town where the main street was littered with boarded up shops, every little bit counts – not to mention the less tangible social benefits such a huge shift in local civic pride. It’s not just struggling small towns who benefit from a cleverly injected shot of well executed public art. We spoke to David Don, a visual artist and the organiser of the Brisbane Street Arts Festival, who’s been at the forefront of the explosion in mural art internationally for many years. Don has produced street art for a number of projects commissioned by Brisbane City Council, as well as major property developers in the area. Their strategy is to turn public spaces into a type of ‘experiential immersion’ for local people and visitors. According to Don a growing number of developers now see quality street art as a must-have in both new and existing projects. “Art brings an authenticity to a location. It creates moments of surprise, narrative and activity. But equally, it has the potential to bring serious economic benefits.” he adds. Brisbane gallerist and curator John Stafford agrees. 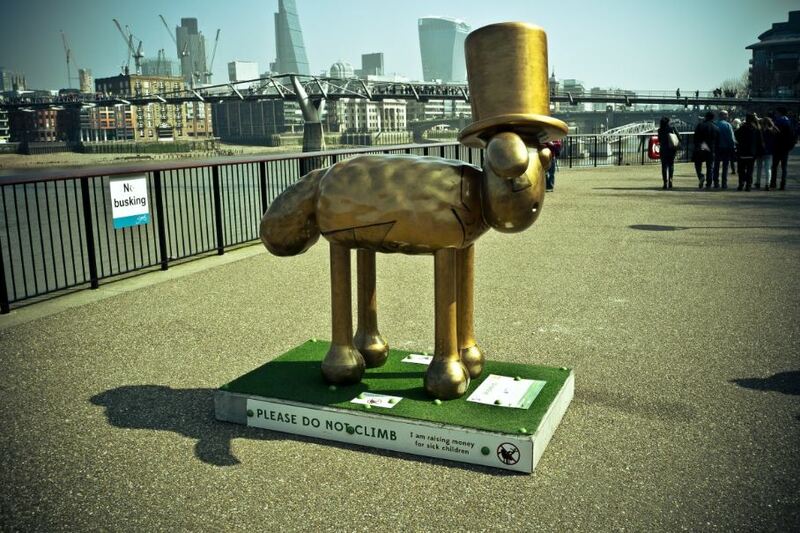 He feels the city is an example of how local councils increasingly see public art not only as a tool for creating safer communities but also for producing a sense of reassurance that a public space and the people in it are being cared for. According to Safford and as far as the city is concerned: “This approach not only benefits local community members but has the effect to boost tourism and the city’s brand and identity as a New World City”. Aware of how social media can make art a much more sustainable career choice, younger artists are increasingly blurring the lines between art and design. Local Brisbane property developers like Aria have been integrating public art into their projects for a very long time. Their strategy is to turn public spaces into a type of ‘experiential immersion’ for local people and visitors. It benefits the community, the local economy, and of course the developers themselves. 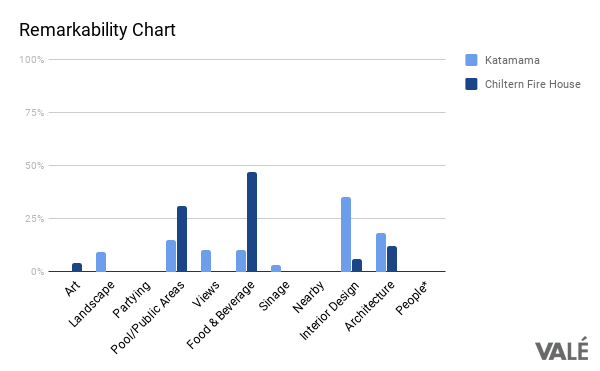 After all, greater footfall and community affinity is more than likely to be reflected in higher property values. Take Red Hong Yi for example, internationally renowned artists famous for creating portraits using everyday materials. Known as Red, her work is particularly interesting because it seeks a strong emotional connection, while also encouraging the viewer to take a particular course of action. She therefore effortlessly brings art and design together, with some of her art pieces lending themselves particularly well for commercial brands. She created an art piece for the Facebook Singapore office which was made entirely out of chopsticks. Her purpose was to inject some fun and creativity into the building. “The engineers housed in the building are coding all day so it balances the right brain thinking”. According to Red, most of the companies she works for see ‘public’ art inside their buildings as critical not only for conveying their brand, but on a more subconscious level also for encouraging their staff’s own creative process. In the future, she sees many more artists collaborating with big brands. It’s a win-win situation for both, with artists able to support themselves better financially, while helping big brands show off in a creative way. So what does all this have to do with your hospitality business? Everything. If a town of two hundred people in the Australian outback can put itself on the map to the point that you are reading about it right now, then think of the value which a beautifully designed space or carefully curated art piece can bring to your own business. It’s a mantra we’ve repeated many times as part of this series – remarkability is key. Inside the hotel, understanding the customer and client’s needs is paramount. If travellers have made the effort to travel to a destination because of its certain vibe, then reflecting and balancing this in the interiors, and in the artwork inside the hotel, is paramount, as the creatives at British design firm Goddard Littlefair know all too well. We spoke to them to get their insight as industry leaders. “Interpreting our client’s brief correctly and effectively is paramount and we conduct in-depth research into market and lifestyle trends to pinpoint exactly what a target market demands,” said Richard McCready-Hughes, the creative director. “We also find that some of our best work is delivered when there is a clear resonance between the aspirations and wants of our client’s target customer and the design team themselves. This is something we consider very carefully when assembling project teams. So, get clear on what your brand stands for and who your future guests are. Then dazzle with quality design and art. Provide your guests with a sense of amazement, creativity and fun the moment they step into your space. But whatever art or design you choose, make sure it reflects your brand, and make sure it creates the right emotional response among your future guests. Most importantly, be original. Doing an exact copy of someone else’s great design is neither creative nor fun. A poorly executed version will only be remarkable on Instagram for the wrong reasons. Then sit back and watch your guests do your PR for you on social media. And just like Coonaplyn, maybe your business will make into one of our future articles. Learn more about designing for niche guests in the Niche Hotel Design Guide by Valé. Missed the last two articles on Designing Instagrammable? It’s okay, catch up on part one here and part two here. Designing Instagrammable: Guest-driven brand stories and how to better understand the mindset of niche guests? Design – and hotel design specifically – is centred around the end user. Therefore, as designers, we should be looking for avenues to better understand the people we are designing for. In today’s world of the instant post and share, there’s three main differences that have existed for the first time in our history. This is the vast volume of photos being taken and shared, secondly the influential sway that many of these photos can have on the success of a hotel and thirdly detailed look into the mindset of a hotel’s guest. “A what?! What do you mean a look at guest mindset?” At Valé we use instagram photos as a design tool to measure user mindsets and influence the directions of a design. The benefit of using Instagram as a design tool is we can generate guest driven brand stories. We touched on this in the Niche Hotel Design Guide, but we believe it needs to be explained in detail to be fully appreciated how valuable this could be for a hotel business. Our goal is to see brands through the eyes of the end user, which in the case of a hotel is the guest. The better we understand the hotel brands guests like, the existing relationships they have with those brands and what they like about them, the more defined our design briefs can be to reach that niche guest. The process involves researching the hashtags and locations tags of brand you want to be like (a muse brand), and categorising the photos users are taking of the property. Sorting into design elements, moments that show people or other common themes you see in a photostream on Instagram. The remarkability chart below we’ve compared two hotels who we believe would attract similar niche guests, but in very different locations. What this does is help build a design story of that muse brand, a story about what their guests finding so remarkable they have to share it with the world. Over a sizable data set of photos, we can start to build brand stories driven by how the guests experience at the property. It can help indicate to the design team things that are important to guests. Understanding your guests mindset in-depth could give hotel owners greater clarity on where to invest time and money in their hotel, if it’s important to the guests you probably want to consider it in your hotel brief. Understanding the social status associated with your public areas (restaurants, bars) play a significant role in a brand identity and awareness. Further detailed analysis over a much larger data set may reveal that a room design only needs to be “good enough” where as your public areas MUST shine, must be remarkable. This again focuses budget where it will have the most effect on your business. We studied a six hotels using social media, review sites and our own observations and broke them into niche guest types, commonly known as archetypes in marketing. Our findings from the social status study is that the guest profiles of what we called Thrifty Destination Junkies & Reality Escapees were more likely to show off they are at a certain hotel. While the Luxury Aesthetic Chaser finds greater delight in sharing the remarkably design buildings, interiors and food with their followers. Those without their finger on the pulse are frankly risking it all. 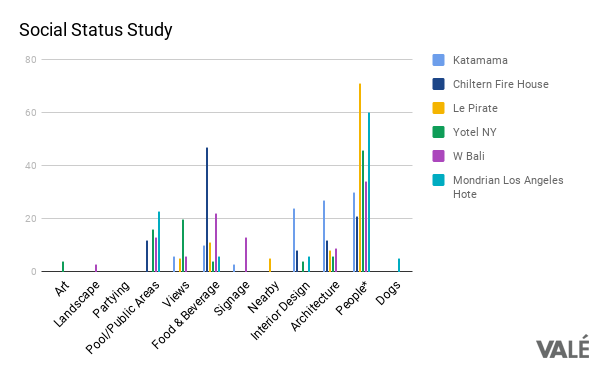 We measured from similar size data sets (in this scenario 50 photos for each hotel) to try understand the importance of being photographed at the hotel vs photos of the hotel. We would link such a study to the social status a guests received from being seen at the hotel and their mindset on the importance of being seen at the coolest places in town. Note we found that when the location was tagged there were greater volumes of images that had account holders in them, rather than images of objects, interior design or architecture. This indicates to us there is a social importance to be recognised to be aligned with a brand. As competition grows and the desire for personalised experiences becomes increasingly popular, designing for niche guests is a hotel’s ticket building a brand long-term brand loyalty. As our online footprint increases, technology and data collection improves we’re going to be able to build ever greater experiences for niche guests. Those without their finger on the pulse are frankly risking it all. Instagram remains firm in being go-to tool for any business that’s serious about growing its brand identity. This year, the platform is fast overtaking most other forms of social media. If you don’t want to fall behind on your competitors, then learning how to use Instagram to promote your hospitality business may your best move all year. With 1 Billion monthly active users, it’s simply becoming essential for your business to have an Instagram account and an active presence. But what’s more important, yet often overlooked, is making sure that your space is designed in a way that makes it remarkable, so remarkable that everyone has to take a picture and share it with the world on social media. Social media, and Instagram in particular, have found a way of tapping into two core human needs of wanting to belong and wanting to feel significant. The vast majority of hospitality businesses Valé Architects consult tell us that they want to appear in the top nine Instagram tiles in a specific location. This appears to be the ‘Holy Grail’ of brand awareness and we understand why. 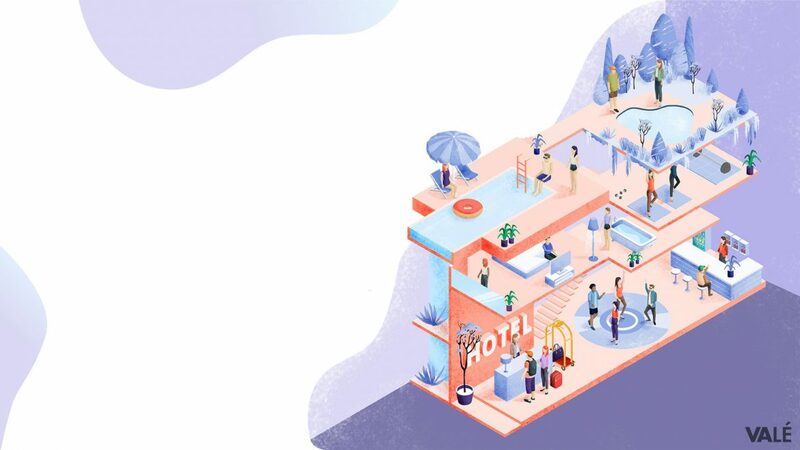 After all, it sends out a clear message to future customers and guests of just how popular and desirable your hotel is with the cool Instagram crowd. But what does it take to be in these top nine tiles in your location? To understand that, we need to dig deep into the psycology of human behaviour. This study was performed in 2011, only two months after Instagram was launched, but those innate human desires to both belong and be someone that matters haven’t changed of course. The only thing that has shifted since then is the sheer volume of people who use social media and the different platforms they use to fulfill those desires. The introduction of Instagram stories in August 2016 provided us with even greater opportunities to share more of our day with our followers. Who do they share with? People like to share with their tribe. This tribe is a hodgepodge of people of family, friends and acquaintances who they know personally, and others who they don’t know personally but share a similar interest with. Many users focus their Instagram feed clearly towards a very defined tribe. Those type of users, we’ll call them influencers, are often able to create a strong and persuasive connection with large numbers of people they don’t even know. But how is it they are able to create these persuasive connections? 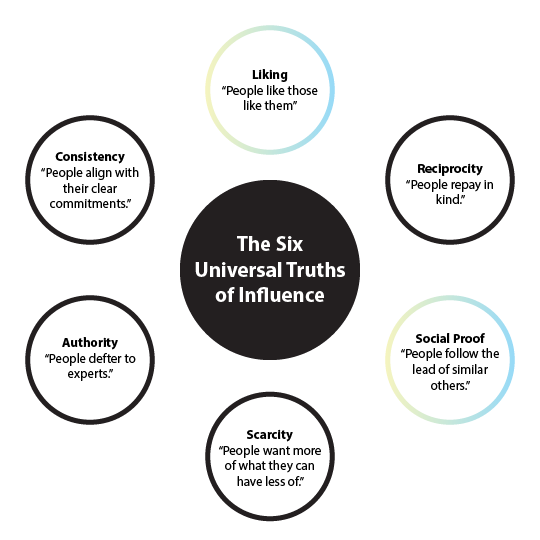 As explained in Robert B Cialdini’s book Influence: The Psychology of Persuasion, there are six universal truths of influence. 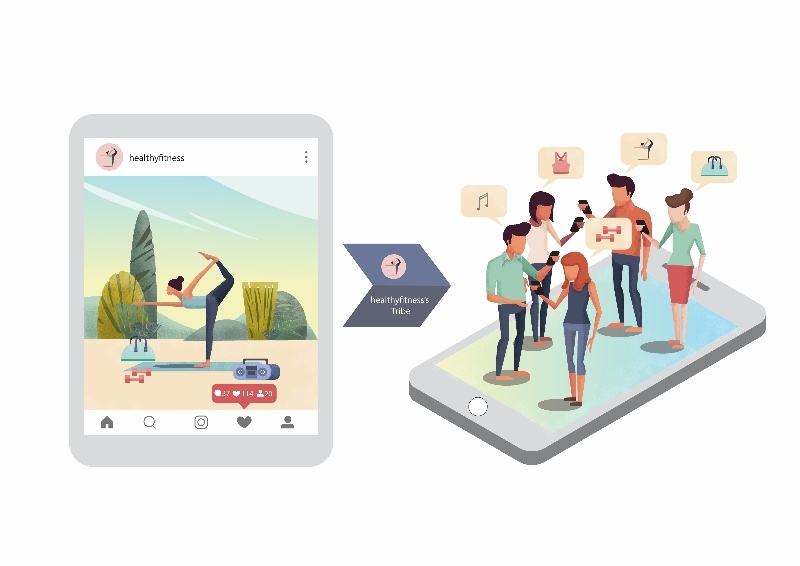 All six principles play a role in the success of social media, but what makes Instagram such a powerful marketing tool is the way in which it uses the principles of Liking and Social Proof. A key behaviour that amplifies this value of liking is the follow on effect of social proof. This means that if you can get people to advocate for your business on your behalf, then the impact is exponentially greater than trying to convince those customers yourself. Marketing guru Seth Godin sums up the effect of these two attributes perfectly. Instagram gives us the opportunity to feel part of the lives of people that inspire us and do similar things to what we do. It allows us to feel connected with those whose lifestyles we are attracted to. The greater the engagement level of the account holder with their followers, the deeper they are connected with their followers. This grants them greater sway to influence the behaviours of a focused tribe of people, potentially helping grow your brand and selling your products or services. How can you use this as a business advantage? If you want your business to be a hit on Instagram, then you really need to find ways to tap into those deeper desires of belonging to something and wanting to be someone who matters. To help you figure this out, we’ve developed an easy to read visual design guide on how to make the design of your space as Instagrammable as possible. To get your free copy delivered to your inbox straight away, download the free Instagram Design Guide from Valé Architects here. References from this article can be found here.